The seismic shift brought on by The Avengers continues to be felt this weekend as yet another “summer” weekend has been given over to some decidedly non-blockbuster films. What hath you wrought, Disney? The career of Melissa McCarthy is a strangely see-saw one, with a rather inconvenient and unfortunate correlation – her worst performing films are the ones she makes with her husband, Ben Falcone, as director, while she's been a general hit-machine outside of that. Maybe stop doing him favors? OK, maybe after this one. Life of the Party sees McCarthy playing a middle-aged newly divorced mother who heads back to finish the college degree she gave up in order to start a family. And hey, why not go to the same college your daughter attends and double up the awkwardness! Also starring Maya Rudolph, Gillian Jacobs, Julie Bowen, Stephen Root and Matt Walsh, it looks like a perfectly acceptable and average Old School/Back to School female-led variation. She does drugs! Sleeps with strange men! Is strangely excellent at being able to organize a retro-themed party! Oh, the laughs never quite end here. 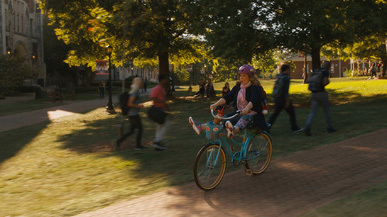 As with previous collaborations with Falcone – Tammy and The Boss – something seems a little bit off here, it's a little rougher around the edges as a movie, cruder and more slapstick than her films made with Paul Feig, which have made 50 to 100 per cent more, and got as far as Oscar nominations. Reviews are fairly bad for this film, and it feels fairly forgettable and disposable as a film. It's not likely to inspire a Girls Trip level of following, and with the typical audience for these college antic films tends to run younger and maler (it's worth noting that Will Ferrell was all of 36 when Old School came out, with his cast-mates running even younger. You Are Old). I'd look for the typical second-tier opening for McCarthy of around $22 million. It's a rehash of a different sort of the weekend's other new film, Breaking In, which plays like a cross pollination of Panic Room and Die Hard. Gabrielle Union (deal with the devil still holding strong on her aging) stars as a woman who travels with her kids to her estranged father's estate to close it up after his death. It turns out to be something of a technological fortress appropriate for the most paranoid of people, and which may be hiding some sort of treasure. It's at least enough for a group of home invaders (led by Billy Burke) to attempt a robbery, kidnapping Union's kids and locking themselves in the house unless she helps them find whatever it is they're looking for. It's at that point that she turns into the avenging ninja hidden within every mother when her kids are threatened. Directed by James McTeigue (of V for Vendetta fame) and written by Ryan Engle (who's behind a couple of the Liam Neeson man-on-a-mission movies, which you can see here if you squint), it's some fairly generic looking thriller-action, though this genre with Black casts has been playing well of late. Think of No Good Deed, which had a very strong $24 million opening against a budget about half that. Union likely doesn't have the following of Taraji P. Henson or Idris Elba, and has been mostly a TV actor for the last ten years. Breaking In has a strong premise though, and Union is quite an engaging presence on screen with a right level of toughness. It's a solid choice for a “remember her” career resurgence and it should have a solid opening weekend at $16 million. So for at least one more weekend, The Avengers has free run of the box office. Despite dropping off buy over half of its start, it still earned over $100 million and will be in gem-throwing distance of $500 million by the weekend. Marvel's magnum opus (Part 1) is about to give Disney two $600 million – maybe $700 million! Black Panther is still going! - in one year and half of the eight films that will have done it once it hits that point. I'd expect about $59 million in its third weekend. The lack of strong competitors leaves only Overboard as a significant returning film. The remake of the Goldie Hawn/Kurt Russell cult classic opened to $14 million with a Latino twist on the premise. This is a fairly significant development in that English language films targeted at Spanish markets can be viable. Especially with the idea of remaking “proven” concepts, we can expect a lot more in this vein. We should see it earn about $8 million this weekend.